Red fire ants are pesky little insects that can cause a lot of discomfort. Fire ants originally come from South America. Soil used as ballast in a cargo ship also carried these nasty critters. Once they got on land in Mobile, Alabama they spread rapidly. Red fire ants can now be found as far away as California, Kansas and Maryland. In the United States, 20 million people each year are stung by fire ants! Red fire ants are more than a nuisance, they can cause serious damage to other insects, wild life that nest on the ground, electrical equipment and crops. Fire ants are responsible for an estimated $1 billion in eradication and damage each year in the state of Texas. Fire ants can make mounds that are as large as 5 feet deep, 15 inches high and 15 inches in diameter, housing thousands and thousands of ants. Red fire ants will attack any living thing that they perceive as threatening their mounds. Fire ant bites hurt from the moment the ant clenches its pinchers on you. Once the ant has a firm grip, it will sting you and inject venom. Then they move in a circle stinging you as many as 10 times before moving on. 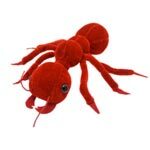 Bites from red fire ants are both painful and itchy. The bites cause red itchy bumps on skin which soon turn into pustules. If you get stung, try not to scratch the insect bite rash. You will only bring blood to the area and spread the venom. If you get bitten, the first thing you should do is wash the affected area. Soaking in a bath of warm water into which you have added 20 Mule Team Borax (3 cups) can be effective. Oral over the counter antihistamines like Benadryl help with swelling and allergic reactions. Placing an ice cube on the affected area temporarily relieves itching and pain. You can also use over the counter topical steroid creams to get some relief. If you are not sure what kind of insect bit you, then it is wise to consult with someone who has experience identifying insect bites. Some insect bites can have very serious long term complications and could even result in death.